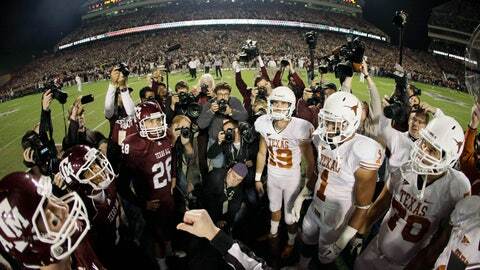 AUSTIN, Texas (AP) — A state lawmaker has filed a bill that would require Texas A&M and Texas to resume their storied football rivalry during the Thanksgiving holiday period. State Rep. Lyle Larson on Tuesday filed the bill for the 2019 session. Lawmakers convene Jan. 8. Larson, a Republican from San Antonio who went to Texas A&M, says he misses the Thanksgiving-time match-up, which had endured for nearly a century. His proposal would require an annual nonconference game on the fourth Thursday, Friday or Saturday of November. The teams last met Thanksgiving Day 2011 in College Station. Texas beat the Aggies 27-25. A&M the following year left the Big 12 for the Southeastern Conference. Larson would like the game to resume in 2019.